"Dance of the Summoner" is a series of painted illustrations that reclaims and reimagines moments when the veil between the spirit world and our world becomes a bit more transparent. With this Patreon I am exploring and centering Afro-diasporic mythology, Afrofuturism, and the magic to be found within the mundane. Each month is a new artwork and a glimpse into my life as a QPOC artist. My goal with this project is to weave together my personal connection to these ancient narratives with afrofuturist visions. Ikenga, Protector of the Sands. Oils and Acrylic on Panel. 2018. Your support on Patreon will provide me with the resources to create more inclusive illustrations. My work centers people of the African Diaspora, Black people, and Queer People of Color. So often our stories and images are either underrepresented or misrepresented. With your support I can create more artworks that go beyond one singular story, and explore a broad and expansive palette of joy, the fantastic, the mundane, black resilience, intersectionality, and all the beautiful nuances in between. Heartwood. Oils on board. 16x24 inches. 2019. Featuring some of the characters from "Dance of the Summoner"
Hello there! My name is Odera Igbokwe and I am an illustrator and painter Odera Igbokwe is an illustrator and painter located in Vancouver, BC by way of Brooklyn, NY. You might know me from projects such as "Odera Redesigns the cast of Sailor Moon", FEM4FEM, "Pepperbreath! : A Digimon Fanzine", or Black History Month: Celebrating illustrators/painters of the African Diaspora. I studied Illustration at Rhode Island School of Design, and West African dance at Brown University. I grew up with Sailor Moon and Final Fantasy in one hand, and 90s R&B dance routines and summer voyages to Nigeria in the other. So all my life I've been pushing both worlds together. "If this was an RPG, Erykah Badu would definitely be a Shaman or Paladin". "Okay but imagine a Studio Ghibli film in Mali! Box braids, griots, and djembes galore!" Now I am constantly creating more inclusive illustrations, that celebrate the diversity of people of the african diaspora, and show that we exist in fantastical realms. 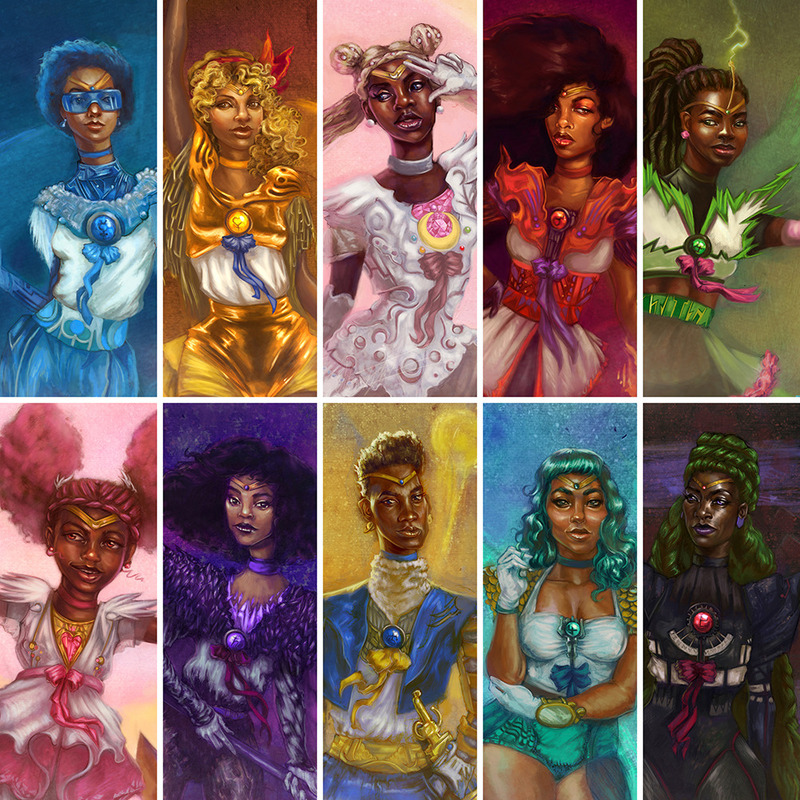 Odera Redesigns the cast of Sailor Moon. This tier will give you access to my Patreon feed, where I document the process of my artwork each month. This tier is great for patrons who want to see how my images are made from start to finish each month. This tier will give you access to any video content that I create. Each month will be at least one timelapse video delving into the art-making process. Additional content will include sketchbook tours, video diaries, and the occasional dance video. This tier is great for patrons who want a deeper look into my art practice, and to see the challenges that occur in and out of the studio. I am currently building an inventory of my earliest artworks (2003) until now. This tier will give you access to viewing that inventory as I build it, as well as monthly posts where I give art tips, advice, and critique to my former self. Twice a year you will receive a personal package of goodies and merchandise from me. The contents include mini-prints, postcards, stickers, zines, and or personalized letters/drawings. One postcard sized original drawing from "Dance of the Summoner" every month. Upgrades your postcard sized original drawing to a postcard sized painted sketch original. Collectors Credit. At the end of every year I will send you an original small painting. If we reach 75 patrons I can afford to upgrade my equipment and provide video and streaming content!